Plantar warts are small growths which occur over the plantar surface of your feet (soles). They can arise over the heels, front region of the sole, beneath the big toe etc. They occur mainly in the weight-bearing areas of the foot. When the plantar wart grows inwards beneath the skin it is called a callus, which is a hard lump. Plantar warts are common in children and young adults. 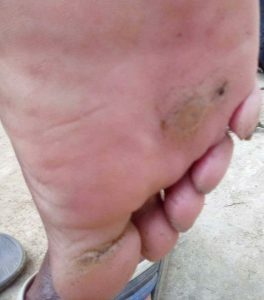 Especially in individuals who walk barefoot and in people who have a week immune system like diabetics, cancer patients, in those suffering from AIDs have a higher chance of getting plantar warts. Human papillomavirus (HPV) is the cause of plantar warts. When there are cuts, cracks or damage to the skin, the virus can enter into the body through them. All individuals who get infected with the HPV virus do not develop warts. However, in some, the virus multiplies in the skin of the sole and form plantar warts. Plantar warts occur in the sole, especially in the weight-bearing areas. They appear as a growth which is skin colored or fleshy. It is rough to touch and the surface is irregular. The lesion can be raised from the surface or flat. Plantar warts are usually small. But they can become large. 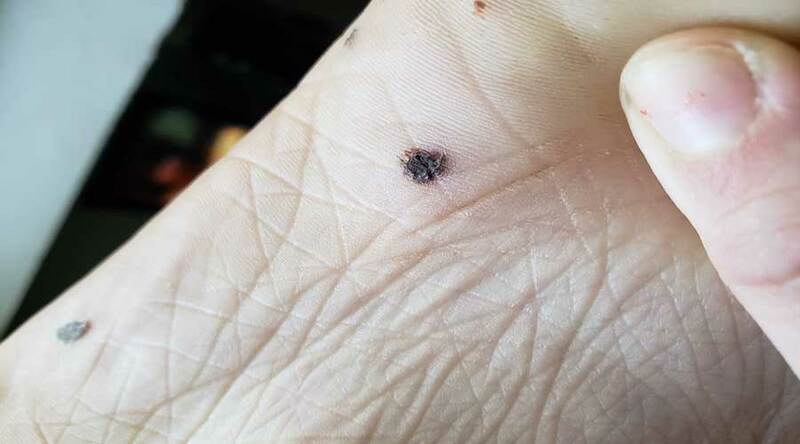 When the wart grows inwards, it can cause a callus. The area is hard with thickened skin which is well defined. What are the complications of plantar warts? Plantar warts are not a serious health issue. You can let them be especially if they are asymptomatic and they are usually harmless. Even without treatment, they will heal spontaneously with time. However, if it is a cosmetic concern or it interferes with walking and if there is the pain then healing plantar warts becomes important. For that, you can try home remedies or over the counter products to get rid of plantar warts. Home pedicures – Immerse your feet in a basin of warm water with a little shampoo. Leave for 10 -15 minutes. Gently smooth the surface of the wart with a pumice stone or emery board. Always keep a separate one for warts. After soaking the wart apply duct tape over it and leave a few days. Once removal of the tape can rub off the wart which is softened with a pumice stone. Repeat the same procedure until wart is totally removed. Garlic paste or apple cider vinegar soaked an in a cotton ball can be applied over the wart and covered with duct tape, will help soften the area more than just soaking with water. This, although helps, is not a proven remedy and is time-consuming. What are the available over the counter products for healing or removal of plantar warts? Salicylic acid is keratolytic which removes dead skin. This has to be applied regularly for a long period. Make sure that the liquid is applied only on the wart and not over the surrounding skin as it can burn the normal skin leading to damage. Applying salicylic acid will burn the wart and peel off the layers of skin covering the wart. Read the instruction leaflet carefully. The treatment should be continued at least for 3 months. Some OTC topical solutions are available with added tea tree oil and cedar leaf oil to salicylic acid. When the liquid is applied continuously the wart will die and the dead tissue can be peeled off within 1-2 months. Pain relief – when there is pain an OTC product like acetaminophen (Tylenol), ibuprofen or aspirin can be tried. Be cautious about the dose and frequency of administration. If you are a diabetic – as diabetics have the loss or reduced sensation over feet, feet should be looked after well to prevent gangrene (dead tissue) or chronic non-healing ulcers. The doctor will do paring of the wart with a scalpel followed by burning the lesion with cryotherapy or liquid nitrogen and freeze it. If lesions are severe surgical removal or LASER treatment is considered. Plantar warts are difficult to eliminate. Even after successful removal, they can recur, so healing plantar warts at the first when it appears is essential.